To provide a single framework that will work with all of the ASP.NET frameworks, such as ASP.NET MVC, Web Forms, Web Pages, Web API, and SignalR. To give the user control over the schema of user and profile information. To allow users to write unit test against parts of the application that use ASP.NET Identity. To make it OWIN compatible. ASP.NET Identity uses OWIN authentication for managing users of a web application. This means that instead of using FormsAuthentication to generate the cookie, the application uses OWIN CookieAuthentication. To support claims-based authentication, which allows developers to be a lot more expressive in describing a user’s identity than membership roles. To allow user to be authenticated using their social log-ins such as using Microsoft Account, Facebook, Twitter, Google, and others. And to enable ASP.NET team to have rapid release cycles, by making ASP.NET Identity available as a NuGet package. With all these design goals and features, it makes Identity 2.0 to be much more mature for today’s web than Membership providers. 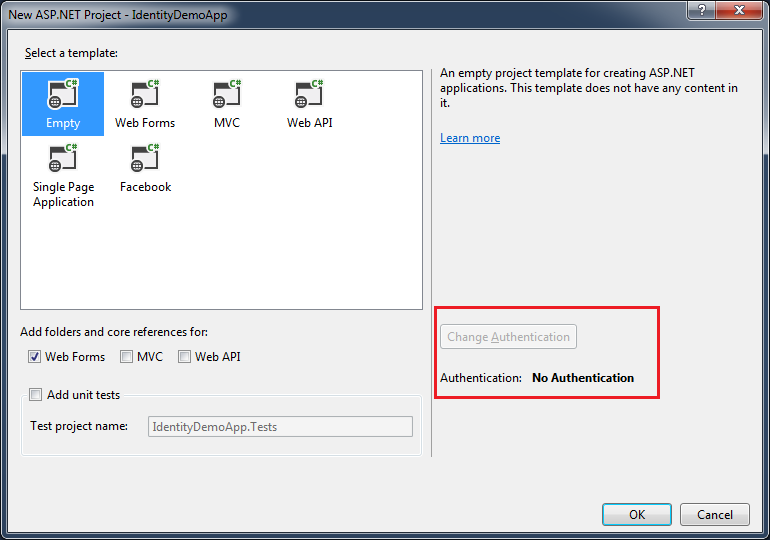 Let's take a look at how we can integrate Identity 2.0 with an ASP.NET webform application. 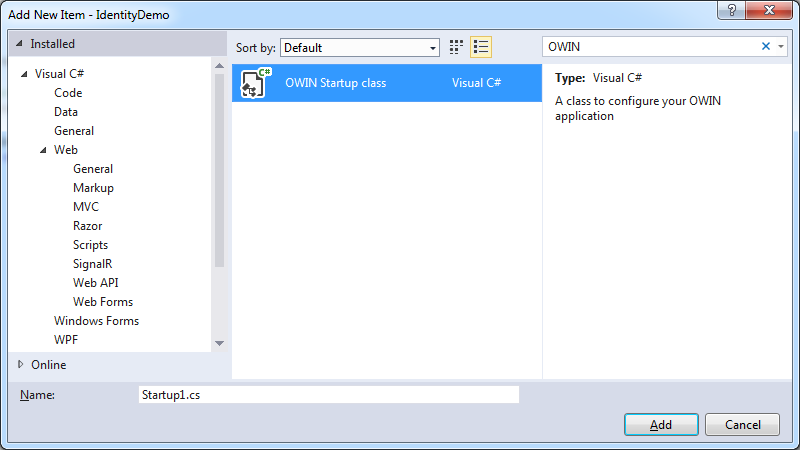 In VS 2013, create an ASP.NET web application by selecting the “Empty” template. Notice the “Change Authentication” button is disabled and no authentication support is provided in this template. It’s ok, we will add our own. Next, let's install the required packages using nuget. We need ASP.NET Identity Core, ASP.NET Identity EntityFramework and ASP.NET Identity Owin in our project. The connection string entry for the database will be used to store user information. The database will be created at runtime by EntityFramework for the Identity entities. Now, add an OWIN startup class. The class name “Startup” and the method “Configuration” with an “IAppBuilder” input parameter is a convention that Katana looks out for and uses to configure the MiddleWare modules. We are all well aware that Forms authentication, used a cookie to represent the current logged in user. Upon subsequent requests from the user, Forms authentication would validate the user with the help of the cookie. Now, with the introduction of OWIN authentication middleware, the new cookie-based implementation is called the OWIN cookie authentication middleware. This performs the same task — it can issue a cookie and then validates the cookie on subsequent requests, with one improvement that it is claims-aware. The “UseCookieAuthentication()” method adds a cookie-based authentication middleware to our web application pipeline. To which we pass a “CookieAuthenticationOptions” object consisting of various option to be used by the authentication middleware. “AuthenticationType” in the options corresponds to the Identity AuthenticationType property, over here we have set it to “DefaultAuthenticationTypes.ApplicationCookie” which is the default value. If we are to be allowing logging in with third party login providers such as using Microsoft/Google/Facebook/Twitter accounts, then we are to use “DefaultAuthenticationTypes.ExternalCookie” (I will explain this in a future post). The “LoginPath” option informs the middleware to change an outgoing “401″ unauthorized status code into a “302″ redirection onto the given login path. The current URL which generated the “401″ is added to the “LoginPath” as a query string parameter named by the “ReturnUrl”. After successful authentication, the “ReturnUrl” value is used to redirect the browser back to the URL which caused the original unauthorized status code. On absence of “LoginPath”, the middleware will not look for “401″ unauthorized status codes, and it will not redirect automatically when a login occurs. The “UserStore” class is the default EntityFramework implementation of a user store. This class implements the ASP.NET Identity Core’s minimal interfaces: “IUserStore”, “IUserLoginStore”, “IUserClaimStore” and “IUserRoleStore”. The “IdentityUser” class is the default EntityFramework implementation of the “IUser” interface. The “UserManager” class exposes user related APIs which will automatically save changes to the “UserStore”. Such as the “Find()” method accepts the user provided username and password and returns “IdentityUser” on match. After getting the user, we create a claims-based identity for the user, by use of “CreateIdentity()” method. The call to “SigIn()” method using the “AuthenticationManager” matches the authentication type to the corresponding authentication middleware mentioned in the “ConfigureAuth” initialization code. Since we have mentioned the cookie authentication middleware, a cookie is issued that contains the claims. Thus call to “SigIn()” does the same job as that of “FormAuthentication.SetAuthCookie()” used by the “FormsAuthentication” module. Using “AuthenticationProperties” object, we can pass additional options while claim based cookie creation, over here “IsPersistent” option indicates if the cookie is to be persistent or not. In order to register a new user, we make a call to “Create()” method, which creates the user and associates the password with the user. After user creation, we create claim based cookie for the registered user. The “Home.aspx” page shows a welcome message and a logout button. The “SignOut()” method does the same job as that of “FormsAuthentication.SignOut()” method used by the “FormsAuthentication” module, by deleting the claims based cookie generated for the user. In my next post, we will see how we can enable two factor authentication for the user accounts using Identity. Software developer, working at Mindfire Solutions, having hands on experience in both Windows and web application using C#, ASP.NET, ASP.NET MVC. Just curious when you run this code what SQL datatables should I expect to be filled? Basically could you show or tell me what your datatables look like from running this code? 1. Error BC30451 - 'Key' is not declared. It may be inaccessible due to its protection level. 2. Error BC30985 - Name of field or property being initialized in an object initializer must start with '.'. I thought I was getting the errors because I was using MVC code, but that doesn't appear to be the case. Is it because it is a Web Site instead of a Web Application? (In other words, because I created the site using File >> New Web Site instead of File >> New Project?) I am so confused! Any help would be awesome! Hi there, can you say how to assign a new user to the Default role of "User" and How can I hardcode myself into "Admin" role. I have a problem with Method .GetOwinContext(). I have a message "'HttpContext' does not contain a definition for 'GetOwinContext' and no extension method 'GetOwinContext' accepting a first argument of type 'HttpContext' could be found..."
Problem solved. I had to install a new package called 'Microsoft.Owin.Host.SystemWeb'. This is exactly what I need to do. I need to add ASP.NET Identity to our non MVC WebForms project. We currently have it working under Visual Studio 2012 (Targeting .NET Framework 4.5.2). The first thing that went wrong for me was that the packages (Core, EntityFramework, and Owin) would not install with Package Manager. Are those features only available in VS2013 and higher? ON). How would I need to manipulate the web.config file to handle this? > In my next post, we will see how we can enable two factor authentication for the user accounts using Identity. Has this ever been created? I was not able to find it. One of the comments here (from 19 Dec 2014) has asked how to deal with third party login providers (i.e. Facebook & Twitter) with no response. I probably will not follow this article more if there is no support from you, the author, as this would indicate to me that it is not working. Database is never created, exception generated. The database never gets created on registration. The exception is that the database can't be attached. I have this same error in several alternative attempts with other tutorials. I can create a vanilla web forms project which uses the 1.0 version of identity and it works perfectly using the standard template. I am using VS2013 and LocalDB works fine for all the development I have done. By the way, the Owin hosting package was also needed to build.